According to the final draft of DP, 2,100 hectares of salt pan lands are now demarcated for the construction of 10 lakh affordable housing development, 1,100 hectares for tourism development and only 30 hectares for salt pans. As per the Coastal Regulation Zone (CRZ) notification (2011) salt pan lands are ecologically sensitive areas falling under the category CRZ 1B where no development activity is allowed except exploration of natural gas and extraction of salts. 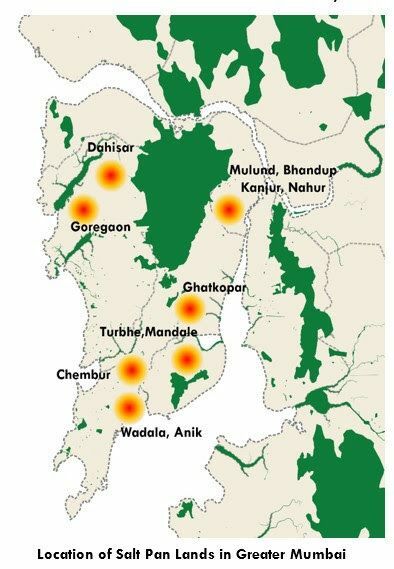 Because of Mumbai’s unique challenges, a concession has now been given under CRZ 2011 to redevelop the NDZ areas under public-private partnerships (PPP), with the FSI in line with the prevailing norms of the city. Moreover, salt pan parcels – previously categorized as wetlands according to Wetland Rules, 2017 – have been tweaked, by no longer terming them as wetlands. This provides the government with an opportunity to convert them to residential-commercial spaces. 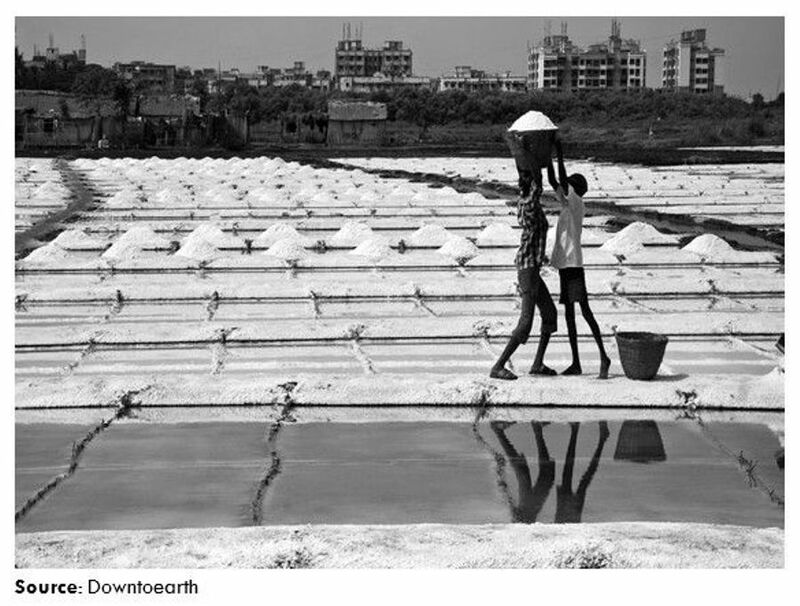 Salt pans lands – geographically the low-lying swathes in the inter-tidal lines – are crucial for Greater Mumbai as they not only provide thousands of salt harvesters a livelihood but also help maintain ecological balance by supporting thousands of species of migratory birds and fishes. The salt pan lands, which also have thick mangroves, act as a buffer line that protects the island city from heavy rains and floods during monsoon. Another critical aspect that will arise from the conversion of these lands for real estate development is that the region will be more prone to earthquakes, as the wet soil is likely to transmit earthquake vibrations rapidly. On the one hand, unlocking of the salt flats in Greater Mumbai to expand its horizons as per DP 2034 comes with obvious benefits like decongesting the island city and its suburbs, rationalising property prices and boosting affordable housing. On the other hand, we have potential drawbacks such as increased vulnerability to seismic hazards, floods and accelerated corrosion of structures due to the accumulation of huge volumes of sodium chloride on the salt pans. It is critical to assess the impact that the additional housing on the salt pan lands would have on the existing urban infrastructure of Greater Mumbai. The creaking suburban rail network and inefficient management of both solid waste and stormwater need to be augmented. Additionally, the ‘carrying capacity’ of the city needs to be determined – specifically its ability to provide all citizens of Greater Mumbai a decent quality of life with access to basic amenities and infrastructural facilities. When compared to other global super cities, Greater Mumbai is seriously deprived of open spaces. As per the Urban and Regional Development Plans Formulation and Implementation (URDPFI) guidelines, 10-12 sq.m. of open space must be allocated per person – currently, only 1.24 sq.m. are available in Mumbai. By increasing the existing open spaces while simultaneously preserving the 12,859 hectares of natural spaces designated in DP 2034, the city’s permeable surfaces can reduce rainfall runoff. This, in turn, aids sustainable urban development. Greater Mumbai basically consists of basalt beneath the ground level surface. Unlike granite, basalt’s composition is weak – and disintegrates when exposed to wind and water. Around two to three years must be devoted to stabilizing the structures as the soil hardens and compacts with reduced moisture. Also, the presence of sodium chloride makes the salt pan tracts liable to corrosion and hence, the structures built on them will be relatively less stable. Another concern with the salt pan lands is the required depth of piling for foundations – which is 15-20 meters until rock is found, when compared to the usual 13 meters-deep foundation. Having said that, the geological and soil aspects’ potential impact of increasing the cost of construction on the affordability of the properties built on the salt land will only become apparent once the DP 2034 begins to materialize.